Are you ready for another DecoArt Media challenge? This challenge will be an Under the Sea theme, anything from bright and fun fishies to dark and mysterious sea monsters and submarine stuff. Our Mixed Media Design Team has been busy creating some great inspiration pieces that we will be featuring throughout the challenge, so get ready for some fantastic project ideas starting July 11th. We can’t wait to see where all your creative ideas take you! The challenge will open for entries on July 11th and close on August 12th. The winner of this challenge will be chosen by the DecoArt Media Design Team on August 15th and announced here and on our Social Media Channels August 19th. The winner will receive a $100 DecoArt Gift Card for use in our Online Store so you will certainly want to submit a piece or two! Don't forget to share with your friends and on social media using #UnderTheSeaChallenge so everyone can join in the fun! Congratulations Alexa Czar! 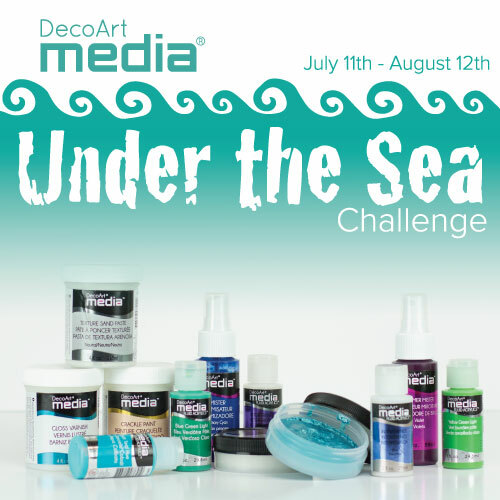 You were voted by the Mixed Media Design Team as the lucky winner of the DecoArt Media Under the Sea Challenge! Click on the photo below to see her stunning entry! Submit your piece below via inLinkz by August 12th 2016. Links are moderated. In order to be eligible to win, your project must use DecoArt products, those products used must be listed in your blog post or photo description. The winner will receive a $100 DecoArt Gift Card for use in our Online Store so you will certainly want to submit a piece or two! Really looking forward to this great challenge! Awesome! I happen to be just starting a large series of undersea multimedia pieces and yesterday on my supply run I just discovered your products and came to your site for instructions on how to use them! It was meant to be! How many pieces can be entered? And can I use a few other products in the piece (like polymer clay, I do multimedia wall sculptures) if there is also a lot of your products in it? Great challenge. Splendid prize. Sooooo excited to see the WONDERFUL CREATIONS everyone will be making!! j.
Wilma, you cease to amaze me, this is awesome!!! Project linked and fingers crossed! My project isn't showing up in the link up area so I hope I did it right! Fun stuff! Love that octopus! Such great creative minds! Amazing dreaming of the sea shadow box! Such gorgeous detail! Very creative idea! Great challenge and wonderful sea inspired inspiration!! So happy to be able to join this challenge! Thank you for sponsoring a fun challenge! I had never used Crackle Paste before and was surprised at the results! I have used DecoArt Dimensional before and never had it crack! This was a good thing when it did crack!! I am thinking it is because I used it over the Crackle Paste! I just wondered why my project is still not showing as I uploaded it Friday 12th. There are so many fabulous entries here!!! Each so unique and fabulous colors and details. How are we going to choose just one?!? BEAUTIFUL CREATIVE IDEAS EVERYONE!! Just wanted to let you know that myself and another gal, Karenliz Henderson,successfully submitted photos of our art pieces while the link-up was still up, and neither were approved to show up with the rest of the photos. Thank you for getting the photos in - I see others were waiting as well, probably more patiently than me- ") So many fab entries here- Best of Luck to everyone!! Thanks for the challenge DecoArt! Well done Alexa, brilliant piece! Awesome winning project Alexa and congrats to you and all the stunning entries for this challenge! Can't wait for the next DecoArt Challenge I am already picking up products to be prepared.